Today’s threat landscape affects users who take work with them everywhere, unknowingly jeopardizing your network and systems in the process. Mitigation of today’s global threats requires a sophisticated and mature security ecosystem. 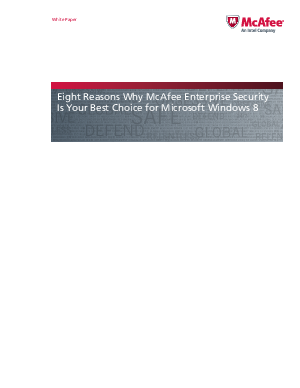 McAfee is one of the few vendors to provide the connections between Windows 8 systems, proactive and comprehensive protection technologies, and the latest security research.